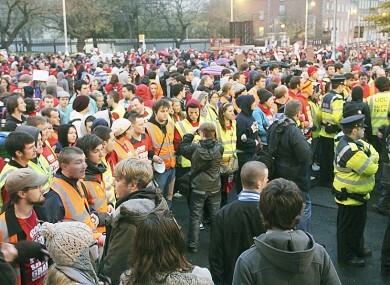 A 'human chain' of USI stewards and Gardaí stopped FEE and Occupy protesters from entering a demonstration yesterday. Protesters say the exclusion was deliberate; USI denies this. A UNIVERSITY OFFSHOOT of the Occupy Dame Street movement has accused other student groups of ‘collaborating’ with Gardaí and security forces in stopping them from taking part in yesterday’s student march in Dublin. The ‘Occupy University’ collective, comprised of students and academics and an offshoot of the Occupy Dame Street protests, said Gardaí and members of the Union of Students in Ireland had tried to stop them from taking part in the rally. In a statement, the group accused USI’s stewards at yesterday’s demonstration of acting with Gardaí in stopping people from Occupy University and other student groups from joining in the main rally, which was attended by an estimated 20,000 people. “It is deplorable that [USI] stewards collaborated with Gardaí in restricting the freedom of movement of people, including the Free Education for Everyone student campaign group,” the working group said. The statement added that their own working group, and a group from Occupy Dame Street who were carrying an ‘#occupydamestreet’ banner, were also blocked from joining the main crowds. USI denied any ulterior motive, however, this morning explaining that the group was simply trying to join a protest through a fire exit – and that the other groups would have posted a safety problem if they came in from a side and forced other students to push backward. “A number of people left the protest on Merrion Street, where you can turn off onto Merrion Street South,” USI president Gary Redmond said. Those students joined FEE in holding a short sit-down protest at Fine Gael’s headquarters on Mount Street, and then returned to Merrion Street where they tried to rejoin USI’s demonstration. “At that point, as per the safety guidelines we had agreed with Gardaí, they were told they could rejoin at the back if they so wished,” Redmond said. He added that a number of the USI volunteer stewards were then abused and heckled, prompting Gardaí to intervene and order the new arrivals to join the protest through an alternative route. Redmond also added that some of the stewards had had their photographs taken, and were told they would be “named and shamed” because of their decision to abide by the safety guidelines they had already agreed, but paid tribute to the stewards for their work on the day. The Occupy University group had complained that while they were hindered from taking part, “TDs from parties who have participated in imposing odious debts on the public were able to participate unimpeded in a march”. Occupy University also criticised USI for opting “not to mobilise secondary school students on such an important occasion”. “We do not need members of unions carrying out operations on behalf of the 1 per cent,” the group said. Yesterday in the Dáil education minister Ruairí Quinn said he had not yet made a decision on whether college fees might be reintroduced, or whether the annual registration fee could be raised further. He later told RTÉ’s Six One news that while he had given a clear commitment in February not to increase college fees, Ireland was now facing “a very difficult time” which was more serious than had been anticipated. Quinn also congratulated students who took part in the march for conducting it in a peaceful and orderly manner. This morning’s Irish Times cites sources who believe the registration fee could be increased by €500 next year, but who say the reintroduction of fees has been “all but ruled out”. Email “USI denies 'collusion' with Gardaí to stop 'Occupy University' protest”. Feedback on “USI denies 'collusion' with Gardaí to stop 'Occupy University' protest”.